It is time again for another installment of Wednesday’s “What is It?”. Inspired by fellow blogger, Leonore, I challenge you to guess what my picture is today. Though I hope to stump you with each photo I post on Wednesdays, I fear this is another easy one. Create your own photo challenge, and join me on Wednesdays. Tag your post with ‘mystery photo’, and use the hash-tag #mysteryphoto on Twitter. 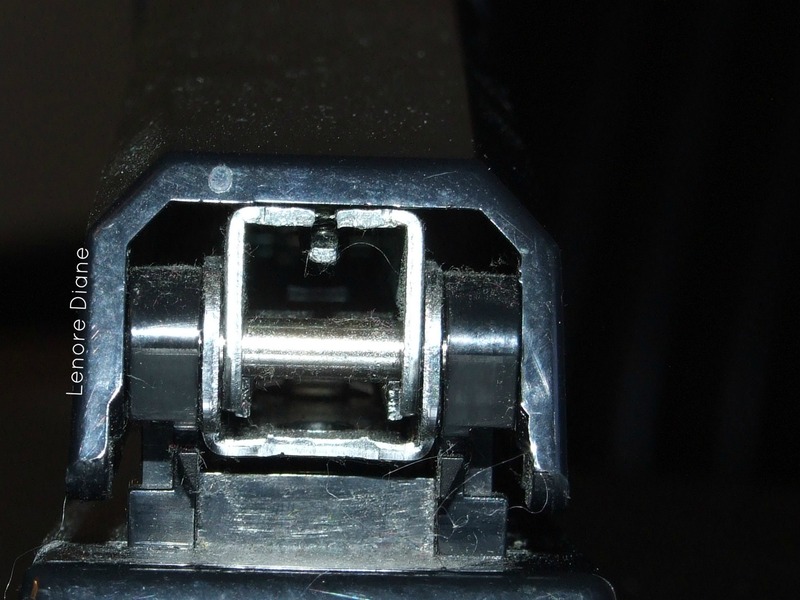 The receiving end for a buckle is my thought: like a seatbelt or for clicking in to a ski. Good guess, Byronic. You were not alone in your guess. I hope you’ll come back next week… assuming I have something for next week. “What is it?” It is hairy and dusty. I win. You got me – it is dusty, but that was not the answer for which I was looking. It took me a while, and initially I was going in a totally different direction, but then as I was thinking about what it could be, my eye fell on the object and I had a eureka moment: a stapler! It’s the back of a stapler. Nicely done, Leonore. You are the first to guess correctly. I’m thinking the back of a stapler. That’s because I’m in my office right now looking at a stapler. Belt buckle! I win! I win!! Woohoo!! You win my love, Kim. Alas, you did not win the mystery photo. But my love is way better. So way more better. It’s a hinge to….aaaugh I don’t know. Can I have partial credit? Hmm its all about perspective. I believe it is the back end of a stapler. Huh? Huh? You are correct, Chris. Most excellent guess. Thank you for playing. I don’t think this is as easy. I’m going to go with seat-belt receptacle. Woo hoo! I stumped Steve!! Hmmm… maybe I should do a “Stump Steve Saturday”. Ha. Never. Too tough a challenge. Well…maybe you’d find one on the space station. 🙂 You so silly, Corkey. I was GONNA say it’s a guy puffing out his cheeks, but then I suspected that wasn’t the photo you were referring to. The shiny, metally thing looks like a seat belt, but what I really want to know is who did that incredibly fine, detailed engraving of your name onto it? Great work there. I’ve been practicing my engraving skills, Peg. Thank you for noticing. Though my engraving skills pale in comparison to your artistic creations with pictures. Looks like a seat belt latch. You were not alone in your guess, Maxi. Thanks for playing. Looking at a 3 hole paper puncher from the long end. Close! Alas, it is a stapler. Thanks for playing, Linda.